x264 is a DCT-based codec, so everything always gets converted into the frequency domain on a per-block basis, which of course can introduce rounding errors in theory, especially at 8 bit. It’s possible they have ways to avoid this, but it’s something to keep in mind. Yes. This is why I’m not convinced that x264 is truly lossless. Ensure tsMuxeR.exe and tsMuxerGUI.exe are in the same folder. Try an earlier version e.g. 2.6.9. Analog mixes, with their inherent limitations, just so happened to fall into the range of what is comfortable for people to listen to over long periods. That being so, a helpful guideline for audio engineers might be to mix in digital as if analog were the intended output. Did you try it? I don’t hear it at all. I don’t even think I hear it when I duplicate the frame 10 times. Yes, I’ve tried it many times. It’s certainly noticeable when I duplicate a frame ten times in a situation like this. But it’s up to you. That’s true, but I didn’t want to clutter up the thread with too much GOUT discussion, some of which has already spilled over from the other thread into this one. I was not sure about the frame count so I just picked a save number. The length of the audio file won’t increase because of a blank clip with to many frames. I just thought that the information might come in useful. I added 4k83 to page1 of the thread. I want to be able to sync any of schorman’s GOUT synced laserdisc tracks to 4k83. So as I understood it somewhere 2 frames need to be inserted. So I want to duplicate the frame before the 2 extra frames 2 times to get an audio file of the correct length, like in the script above. The result wouldn’t sound very smooth, but you could do that. If you take that approach, duplicate the frame before once and the frame after once: it will be less noticeable. However, frame 68663 is already past the wipe, so I don’t think it’s the correct position. It is though – I’ve checked. The missing frames occur before the cut to the briefing room. After the wipe, watch the first fighter that clears the nose of the Mon Calamari vessel. EDIT: By the way, the frame-count of the NTSC GOUT post-IVTC is 190799. My Avisynth-fu has never been anything except rusty, but I think that means if you delete frames 68664 and 68665 from 4k83, you’ll get NTSC GOUT. Although I don’t see how there can be 2 extra frames after frame 68663. It’s the two missing frames of the rebel fleet immediately after Luke’s conversation with Ben. Perhaps you are more used to the PAL GOUT. What are you trying to re-sync, Arnied? Okay, but I also mentioned missing frames, not just audio. You did, and I addressed the frames issue as well. Why go through that trouble with cutting the audio and frames from a more complete source just to conform to a less complete source? If the answer is just that it’s convenient to stick with a known standard that already has other tracks synced to it, then I certainly understand that. I just personally value completeness and historical accuracy more. It’s convenience and a desire to uphold a consistent standard to avoid confusing people. Until now, people have known that they can swap tracks between GOUT-synced releases (which the vast majority of major projects were) and not worry about sync issues. Changing standards would bring considerable potential for confusion. When I say it’s “flawed”, I mean that frames are missing and the audio (at least in ROTJ) had to be looped in a certain place to maintain sync with the video. And I repeat that it doesn’t matter what the audio on the GOUT is like, because one can still use the GOUT as a standard for which frames to include in any given release. The fact that the missing frames for RotJ are in the middle of a reel makes adjusting the audio a little trickier, but it can still be done in high quality with software that can stretch small portions of an audio track to maintain sync but leave the rest untouched. And it just seems counterintuitive to actively remove frames & audio, just so it syncs with the flawed GOUT audio. It’s got nothing to do with syncing to the GOUT audio. The GOUT standard was about which frames were to be included in any given release so that decent audio, subtitles, and foreign dubs could be easily muxed in. This was very important in the days when we were syncing LDs that had all sort of frame differences – those were the releases that sometimes had black frames inserted to maintain sync; it was also important when editions (notably Harmy’s) that were based on the SE DVDs (and later the BDs) were produced. The GOUT could have been released with a laugh track and still have served as the basis for a standard as to which frames to include. Why would anyone insist on maintaining an incomplete and low quality standard like the 2006 gout. Again, it’s got nothing to do with the quality of the GOUT. The GOUT could have been a film scan, the best DVD release in history, or the low-quality LB 4:3 DVD that it was and still have served as the basis for the standard. There are high-quality UHD BDs based on excellent modern remasters that drop frames that were found in earlier releases – they are not butchering films by doing so, because there’s nothing sacred about a frame or two. Competing modern restorations drop different ones. If people want to push for a new standard, that’s fine. I’ve reluctantly come to accept that we’ll probably get one whether I like it or not, and I’m prepared to contribute (as far as I am able) to the effort to resync existing work. But I wish people would drop the misconception that the GOUT’s being a low-quality source has any inherent connection with its serving as a standard – it doesn’t. Overall this is more about correcting existing sync problems, by using the more reliable reference which is now available. Do you plan to sync your mixes to both the GOUT and frame-complete releases such as 4k83, or are you going to pick one? I’m currently beginning the tedious process of converting the frame numbers for the reels into timecode that I can see in my audio editor, so once I’ve done that I’ll know exactly how the sync of Jedi is supposed to work. Is there no way you can automate the conversion? At worst, you can read off the frame-numbers in VirtualDub/AviSynth. That’s the question. I’m willing to jump on board if some other video maintainer does, but at the moment I’m not jumping based on speculation/probability. It’s certainly one pertinent question. I don’t imagine anyone expects you to adopt a new standard straight away. It’s early days yet. Multiple derivatives of the same source video with different processing options isn’t really the same thing IMO. It’s not quite the same, I agree, but multiple frame-complete releases (derivative of one source or not) into which people will want to mux a given audio or subtitle track will lead to the same requirement for synced versions of those tracks. 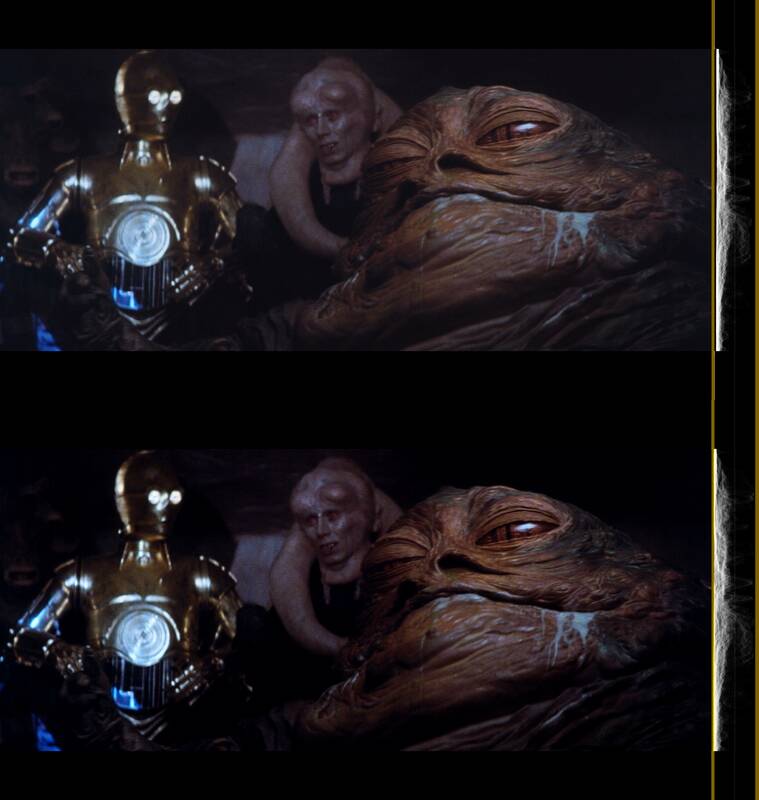 And once frame-complete 4k versions of the OT are out, how many other projects will go to the trouble of dropping frames to maintain GOUT sync if they no longer need to (audio from those 4k versions being readily available)? There’s also the fact that hairy_hen and schorman have moved in step with 4k83 and will presumably continue to do so. Their latest mixes (which, as I understand it, involve improvements) are synced to that. Will they make GOUT-synced versions for legacy reasons? I’m also coincidentally not convinced of the need for a new standard. I’ve been against it, but as 4k83 is complete in terms of frames and future 4k releases seem set to follow suit, we’ll have a new standard whether we like it or not. Those are the versions that people are going to want. However, the assumption that the GOUT audio was also synced to that frame reference seems natural. It’s certainly natural, but it’s not something that necessarily follows. It depends on how one syncs audio. While I’m glad that hairy_hen and schorman are on board with the new standard, because it will make adopting it far easier, I can’t help wondering what will happen with all the foreign dubs. Is someone going to resync them systematically? Yeah, blacks look a bit crushed to me. In many shots, the whites are blown out after ColorYUV(levels=“TV->PC”), too, so it’s definitely not a straightforward levels problem. I’d say that the luma range has possibly been compressed a little while the video was (already) in the TV range, which has the usual effect of making it look a bit too bright and somewhat undersaturated. Fascinating! It’s long been my suspicion that people who prepare home-video releases often make the same sort of rough edits that fans do. It’s nice to have some corroboration of that. To be clear, the 1993 laserdisc source does not have this kludgy edit; only the GOUT itself has it. That hints at an important distinction. The GOUT was always a reference for which frames to include. I don’t recall the AC-3 tracks being used very much (if at all) as a sync reference. In other words, the damage that the GOUT’s poor audio had on past audio work was probably minimal (and less than one might first imagine). But you’re undoubtedly right that your findings are good reason to establish a new standard. The main thing to start with is exactly what frame the main title music should begin on, and I have not figured this out yet. The precise timing of everything else can be established once this is known. Send me a PM when you are ready, and we can work some things out. I’d like to keep this thread for the old standard and start another for the new – that should minimize confusion. I’m sorry to say it, williarob, but it might be as simple as a levels issue. N.B. I don’t think that the standard adjustment works well for the whole film (at least not for the blacks), but it definitely gets the levels in the right ballpark. Now THIS is 74-Z racing! ^ Understood. I thought that the color work had preceded the clean-up. The subtle pink cast has been completely removed, which is great, but I kinda like the grain. Is there any possibility of releasing a version of 4K77 with the colour timing of the DNR version and film grain? It would be the best of both worlds. I’d very much like such a version as well.